Busy, analytical&#160;people need special tools to help them sort things out efficiently. And when they take a break from their detail-oriented work, they may enjoy a detail-oriented diversion. With these programs, you can get the scoop on who's visiting your Web site, pinpoint word meanings, and solve a slick puzzle. 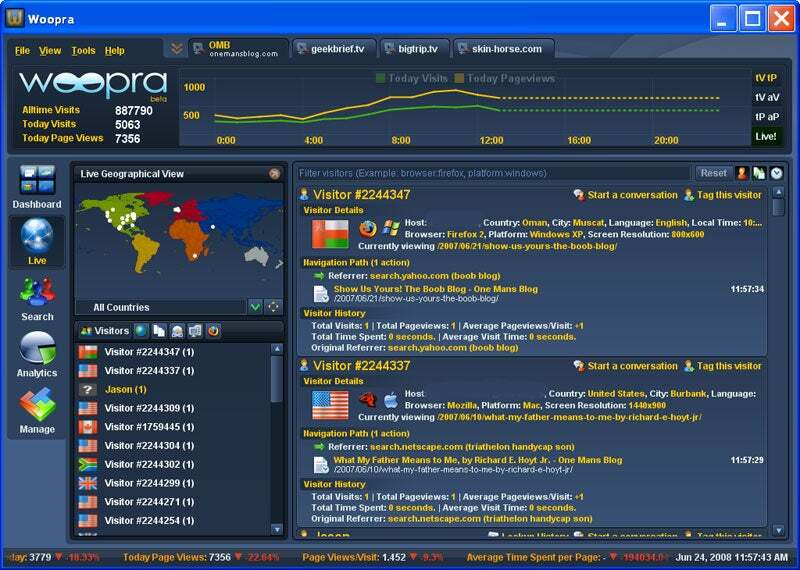 Go metric with Woopra--and gather all kinds of data about the people who visit your Web site. There's more to Web page data than hit counters. But some really useful tidbits--where your readers are, what OS and browser they're running, and so forth--are hard for the average site owner to find. Woopra serves up all kinds of data in a clean, easy-to-understand interface. Because Woopra's beta has been popular, there can be a waiting list for the service. Vendor iFusion Labs is aware of the issue and plans to step up the rate of account activations soon--perhaps even by the time you read this. Go ahead and get in line: It's worth the wait. I say (and define) 'tomato': The Talking Merriam-Webster Dictionary defines 10,000 terms by voice and 45,000 in writing. Most people who work at PCs either fumble with a heavy paper dictionary or fire up a browser and surf to one. The Talking Merriam-Webster Dictionary sidesteps both problems, keeping a dictionary at the ready in your PC's system tray. Altogether, the Talking Merriam-Webster Dictionary contains 75,000 definitions for a total of 45,000 entries, including 10,000 that the program deliver in spoken form. Searches are easy to perform, and they return results quickly. If you like, you can choose and resize the fonts. Advanced Mode includes a Notes field in which you can annotate entries yourself. 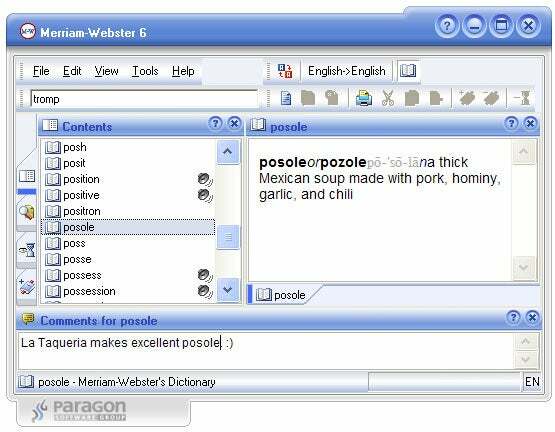 If you have any of vendor Paragon's other Merriam-Webster dictionaries--foreign-language or medical, for instance--you can search all of them from the same interface. In the version I tested, pronunciations sounded more British than American in accent. Though pleasant, they might not help someone trying to communicate in the United States. The choice of words recorded could be better, too: Tricky ones are sometimes missing while obvious ones are included. Surely we'd benefit more from hearing "trompe l'oeil" pronounced than "troop." Paragon promises that the sound file available by the time you read this will feature native speakers of American regional dialects. This demo version works indefinitely, but nag screens begin popping up after 100 definitions. 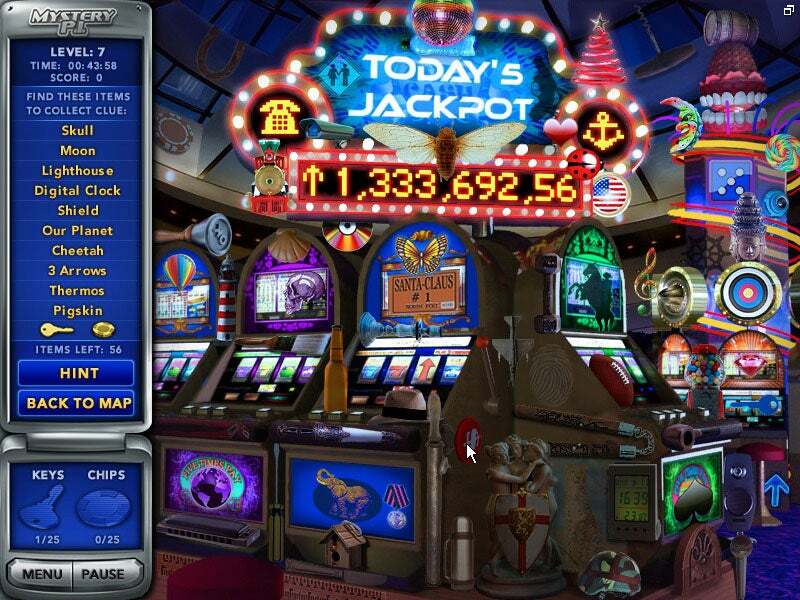 Highlights for adults: SpinTop Games' casino-themed Mystery PI: The Vegas Heist stylishly updates the hidden object puzzles of your childhood. When $4 billion vanishes from Las Vegas's newest casino, the owners turn to the Mystery PI. You have to nose through some shady locations--but in the Mystery PI: The Vegas Heist, every spider or socket wrench could be a clue. This sharp-looking game is a grown-up version of the hidden-object puzzles you used to solve during rainy-day recess. These cluttered and realistic-looking Vegas scenes offer items in obvious context as well as trickier treasures, such as a lightning bolt that's part of a sign or a gigantic nail file worked into a vehicle. Hints ding your score--and the hint-o-meter takes time to recharge--but it's worth caving in when you don't know what 'car transmission' or 'antique iron' looks like. Mystery PI: The Vegas Heist is an entertaining and stylish brain-teaser that should appeal to puzzle fans. But beware: SpinTop Games gives away only the first hour for free. After that, you must either buy the $20 full version or hang up your trenchcoat and fedora for good. Did you have an interesting experience with one of these programs? Is your favorite file missing from PC World's Downloads library? E-mail your comments to Laura Blackwell. Messages containing attached files will be deleted unread.